Video interviews, panel discussions, articles and Q&As featuring Christian Calvin. Last year we interviewed Christian Calvin about two profitable flips ($81 to $12,500 and $99 to $9,000, both within just months of acquisition). Today we learn how Calvin has sold more than 200 domain names (a 17 percent portfolio sell-through rate), garnered more than $200,000 in revenue, and profited by more than $60,000. 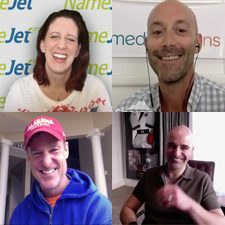 You’ll also hear how he selects his brandable domain names, what his process is for managing domain names, how he optimizes his sales process, how he’s trying to liquidate 30 to 50 domains per month at NameJet to right-size his portfolio, and why he turned down a six-figure offer to sell his entire portfolio. On this Profitable Flips show, we talk to Christian Calvin, who entered the industry in late-2013 and dismissed the advice of an experienced and proven domain name investor. From $80.55 to $12,500 in four months with RaiseTheMoney.com, and from $98.55 to $9,000 in less than one month with SuiteSeats.com – buying and selling brandable domain names. He continues to focus on brandables, and is targeting a mid- to high-five figure profit margin in 2015 for his business, PlentyOfBrands.com.